Big Little Lies is an American television drama series that premiered on HBO on February 19, 2017. Created and written by David E. Kelley, the series' seven-episode first season is based on the novel of the same name by Liane Moriarty. Big Little Lies stars Nicole Kidman, Reese Witherspoon and Shailene Woodley. Alexander Skarsgård, Laura Dern, Jeffrey Nordling, Adam Scott, Zoë Kravitz, and James Tupper feature in supporting roles. Critically acclaimed, the series garnered several awards. Despite originally being billed as a miniseries, HBO renewed the series for a second season. Production on the second season began in March 2018 and is set to premiere in 2019. The entire main cast will return with the addition of Meryl Streep. 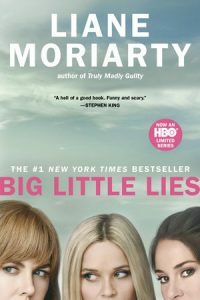 If you like Big Little Lies, check out the suggested titles below. They're filled with strong, female protagonists, as well as lies and deceit of all kinds. Mary Rose MacKinnon is a successful author of young adult fiction doing a tour of duty as stay-at-home mom while her partner, Hilary, takes a turn focusing on her career. She tries valiantly to balance the (mostly) solo parenting of two young children with the relentless needs of her aging parents. But amid the hilarities of full-on domesticity arises a sense of dread. With humor and unerring emotional accuracy, Adult Onset explores the pleasures and pressures of family bonds, powerful and yet so easily twisted and broken. The rich and powerful Josephine Lazarow, matriarch of Fairham Island, is dead. The police say it's suicide, but Keith, her estranged son, doesn't believe it. Keith bears scars, both physical and emotional, from his childhood, but he's worked hard to overcome the past. After walking away from his mother and her controlling ways five years ago, he's built a new life in L.A. He's also accumulated a fortune of his own. But as soon as he learns of his mother's death, he returns to Fairham. He feels he owes it to his grandfather to put the family empire together again, and he's determined to find his mother's killer. The divorce has just become final, and Richard is already engaged to someone. One woman is determined to change that situation - no matter what it takes. Soon a tangle of lies binds her life with those of Richard and his new fiancée. A tangle of lies - that hide some dangerous truths. View more suggestions for Big Little Lies.